Classical Net - Basic Repertoire List - J. Strauss Jr. The genius of Johann Strauss genius lay in his ability to take the popular salon music of Vienna in the early decades of the 19th century – with its clear emphasis on melody and dance rhythms – and convert it into music which not only became fashionable but which in time evolved into high art. His conducting talents (and that of his father's before him) were clearly of prime importance in achieving these aims. 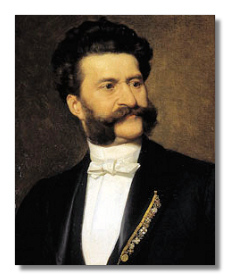 Johann Strauss Jr was born into a musical dynasty of just one generation. His father, Johann Strauss Sr came from a desperately unhappy Viennese family; the mother died when he was seven and the drunken innkeeper father committed suicide. Johann Sr's behavior to his own family was little better; by the time he was in his late twenties he was being openly unfaithful to his wife, by whom he had six children. Johann Jr saw little of his father who set up house in a dingy flat in Vienna with his mistress, by whom he proceeded to have five more children, all born out of wedlock. Although Strauss Sr was by then internationally famous as a composer of superior dance music (played by his own orchestra), he banned any of his own children from following in his footsteps, considering it too risky and fragile an occupation. His three legitimate sons ignored his advice. Johann Jr was the oldest, and although he conscientiously completed his education at the Gymnasium and Polytechnic, advancing to the position of clerk in a savings bank, his mother had long encouraged his secret musical ambitions. By the time he was a teenager, he was an accomplished violinist and showed flair for leading ensembles, leading his own (in direct competition with his father's) by the time he was 19. He had also begun composing at a very early age. Although in his first years as a musician he kept strictly to the type of music already coined by his father and other contemporaries. In 1849 Johann Strauss Sr died of scarlet fever in the apartment of his mistress. She decamped, leaving the body and little else. Within a short time Johann Jr had merged the two rival orchestras. Thus equipped, he quickly became the unchallenged leader of the Viennese dance scene, occupying several important posts in the capital's ballrooms and touring Austria, Germany and Poland. He had the rare combination of an artist's talent and an impresario's ability to exploit to the maximum the main chance, using a formidable network of contacts for the purpose. This he did so successfully that several times he collapsed through sheer exhaustion, his brother Josef taking over leadership of the family orchestra until Johann recovered. In 1856 Johann was commissioned to supply a set of autumn concerts in St. Petersburg as part of a campaign by Russian industrial magnates to bring the fashionable set to the city. Strauss was paid handsomely to run these concerts, the orchestra playing a combination of popular classics and Strauss' own compositions. This lucrative connection lasted for a decade, while Johann Jr steadily amassed a considerable fortune. At the beginning of the 1860s Johann met an old acquaintance, Henrietta (Jetty) Chalupetzky, a retired mezzo-soprano who was independently wealthy, a good ten years older than Johann and the mother of five illegitimate children. They were married in late 1862, Jetty taking over the task (done until then by Johann's mother) of running the Strauss music-making business. By 1864 the Strauss family machine was working in top gear. When the reigning operetta king, Jacques Offenbach, made a visit to Vienna, Johann saw an opportunity to extract maximum publicity: he was contracted to supply a waltz for the "Concordia" Ball in the Sofienbad Saal, and hearing that Offenbach had also been commissioned, he prevailed upon the critic Eduard Hanslick to ask Offenbach for permission to publish both waltzes through his new publishing partner, Spina. Offenbach agreed, and the Strauss Orchestra performed first Strauss's Morgenblätter at the ball, followed by Offenbach's Abendblätter. This friendly contest gave Strauss not only a national boost but an international profile. It is often alleged that Offenbach suggested to Strauss that, considering his gifts for melody, he should seriously consider writing operetta. Ten years later Strauss would score a notable success by doing exactly that. Meanwhile, the wonderful waltzes and polkas kept appearing, with the most famous of all, An der schönen, blauen Donau (On the Beautiful, Blue Danube) appearing in 1867, curiously enough to a muted response, many of the audience wondering whether this masterpiece had overstretched the genre for which it was written. Blue Danube and other favorites were played during an exhausting trip to America in 1872, and were phenomenally successful. On his return to Vienna, Johann began developing ideas for an operetta which eventually became Der Carneval in Rom. It was premiered in Vienna in 1873; although not a sensation, it was sufficiently popular to encourage Strauss to continue in this vein. It was the director of Vienna's Carl-Theater, Franz Jauner, who suggested to librettist Richard Genée that he produce an operetta book of the successful French play Le Reveillon, written by Offenbach's librettists Henri Meilhac and Fromental Halévy. On seeing Genée's work, Strauss was immediately convinced that it was a suitable vehicle for his talents, and in the fall of 1873 set to work on the music. It soon took shape as Die Fledermaus. The April 1874 production was a roaring success and within three months a production had opened in Berlin. By the end of the decade it had been performed in countries as far apart as America and Australia, and was Strauss's most successful operetta of all, perhaps even in time eclipsing Offenbach's Orphée. From now on Strauss's creative life was firmly divided between his instrumental and his operatic ventures. Strauss had unfortunately inherited his father's proclivity for indulging in extra-marital affairs; Jetty managed to bear this with dignity for many years, but by the time of Fledermaus, the marriage was in tatters. The impasse was only resolved by Jetty's death from a heart attack in April 1878. Strauss promptly remarried an actress, Angela (Lili) Dietrich, but the age difference (she was 27, he was 52), and his compulsive work patterns soon drove a wedge between them. Frustrated by his long absences and her dull life, she began an affair with theatre director George Steiner, eventually eloping with him. An uncontested divorce was granted in 1882. Strauss immediately took up with a 26-year-old widow, Adele Oeutsch, and the two were soon living together in Vienna. The spring of 1883 saw the first performance of the famous waltz Frühlingsstimmen (Voices of Spring) initially with text sung by a coloratura soprano, but then in the purely instrumental version which remains popular today. His opera Eine Nacht in Venedig (A Night in Venice) was premiered in Berlin in the same year; the mediocrity of the libretto damaged its initial reception, but much work was done to improve it and by the time of the Viennese premiere it was a complete triumph. A summer 1884 cure in Franzensbad left Strauss recharged and impatient to start the music for his next operetta, one on which he and his new librettist, lgnatz Schnitzer, lavished more care than on any other in the composer's career. This was Der Zigeunerbaron (The Gipsy Baron), arguably Strauss's greatest operatic achievement, even if it has not achieved the overall popularity of Die Fledermaus. This work, begun in early summer 1884, was not finally finished until late 1885 – an unheard-of gestation period for someone like Strauss – but the first-night applause convinced Strauss that it had been worth the effort. Two years later, convinced that in Adele he had finally found the right partner, Strauss arranged for a release from his Austrian citizenship and was then accepted as a citizen of the small German dukedom, Saxe-Coburg-Gotha. He also left the Catholic church and became a Lutheran Protestant, thus avoiding the papal intransigence which had ensnared the devoutly Catholic Franz Liszt's attempts to remarry. He and Adele were married in 1887. His last decade was relatively content, Adele giving him the energy and support he required. She also brought him a new circle of friends, one of them being Johannes Brahms, an admirer who in time became one of Johann's most valued friends. Johann was deeply moved by Brahms' death in 1897, and took a long time to regain anything like his former vigour. By early 1899 he was preparing for the premiere of his ballet Aschenbrödel (Cinderella). Sadly, he was not to live to complete the full score, or see it performed: in May 1899 he fell prey to a chill which quickly developed into pneumonia. The years of punishing hard work had destroyed his powers of resistance and he died on June 3, 1899. He was laid to rest in Vienna Central Cemetery near the tombs of Brahms, Beethoven and Schubert. Where Strauss differed from the rest of his family was the point at which he combined the Viennese dance tradition with the Parisian operetta forms largely devised and developed by Offenbach. Today it is widely agreed that Die Fledermaus and Der Zigeunerbaron are the greatest of all German-language operettas, and stand comparison with the best from the other opera genres of the time.